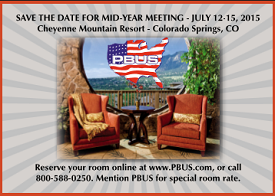 Have you made your room reservation yet for the Mid-Year meeting at the Cheyenne Mountain Resort in Colorado Springs? We are already at 54 percent of our room block. Make your reservation here or call 800-588-0250. Register for the conference here! Download the mid-year marketing postcard now! Pennsylvania's bail bonds industry is a step closer to increased regulation after the unanimous passage of HB 367 by the House Judiciary Committee this week. Drafted by state Rep. Bryan Cutler, R-Peach Bottom, the bill requires bondsmen to be licensed as insurance producers by the Pennsylvania Insurance Department and to secure assurance of financial ability to cover assumed liability in their cases. Miss an issue of the PBUS News Update? Click here to visit the PBUS News Update archive page. A New Mexico Supreme Court decision issued last November is having a potentially far-reaching impact on where criminal defendants reside and the conditions by which they must abide as they await trial. For the second year in a row, an audit by the office of Controller Michael Namie has found that Washington County jail personnel are not turning over bail bond money to the clerk of courts' office on the next business day as required by the jail's own policy. Council Speaker Melissa Mark-Viverito wants to hand Get Out of Jail Free cards to criminal defendants — paid for not with Monopoly money, but with yours. Making bond is sometimes the only thing that stands between a suspect and being released from jail. Sometimes, when bonds are high, coming up with the 10 percent you have to pay can be difficult. Bond companies have allowed clients to pay part of their 10 percent bond and credit the rest in smaller monthly payments. The Washington Police Department may have broken state law by setting and collecting bail bonds from individuals arrested, according to a report from the Louisiana state auditor.